Maine is a very family-friendly state with lots of to offer young families. Throughout the state, you’ll find resorts and hotels for families, ranging from exciting campgrounds, to cozy B&Bs, to massive resorts with all the amenities. Enjoy kid-friendly activities, and plenty of rest and relaxation for the parents. Whether you prefer the mountains or the ocean, here are the best hotels and resorts for families in Maine. The Rhumb Line Resort in Kennebunkport is an affordable and kid-friendly resort on the coast of Maine. The hotel has both indoor and outdoor heated pools and hot tubs. Located just a short walk from the ocean, the hotel is also on the Trolley Route making getting into town easy. All kids 12 and under stay for free. The Ogunquit Resort Motel is perfect for any water-loving family with kids. The hotel features a large outdoor pool and hot tub with plenty of grassy areas to play. The rooms are spacious and have cable televisions, free Wi-Fi, and mini fridges. Located on 450 acres on Casco Bay, the Sebasco Harbor Resort has been welcoming families since 1913. The resort has 133 guest rooms scattered throughout their Main Lodge, cottages, and even a lighthouse. There is a large saltwater swimming pool located on the harbor’s edge and kids will love Camp Merritt. Popular with couples, the Samoset Resort is also family-friendly. With stunning views of Penobscot Bay and outdoor pool, the Samoset Resort has lots to offer kids. Children ages five to 12 will enjoy the Samoset Kids Club where staff organize fun activities like scavenger hunts and nature walks. The 775-acre Point Sebago Resort on Sebago Lake is the perfect affordable family vacation in Maine. With a one-mile sandy beach, tennis, golf, shuffleboard, and more, the Point Sebago Resort will have kids talking all summer long about their recent vacation. The resort has free supervised Children’s Camps and Activities everyday throughout the summer. Lodging options range from resort cottages, vacation homes, and camp sites. Grant’s Kenneabgo Camps is the perfect place for a real Maine outdoor adventure. With good old-fashion hospitality and the ultimate natural background, kids will forget all about their mobile phones and video games and enjoy the best of Mother Nature. Family-friendly activities include canoe wildlife adventures, hiking, sailing, and kayaking. Friendship Oceanfront Suites’ two-room suites and beach condos are perfect for any family vacation to the beach. Just one mile from the pier and minutes from the long sandy beach, the resort has a large saltwater pool and free Wi-Fi. Suites feature mini fridge, microwave, TV and DVD player, and lots more. Perfect year-round, the Bethel Inn Resort is near Sunday River for skiing in the winter and tons of hiking trails and waterways for summer fun. Located in the heart of Bethel’s historic town center, the Bethel Inn Resort is close to tons of restaurants and shops. Kids will love the heated outdoor pool and hot tub. Ditch the hustle and bustle of the city and head to the western mountains of Maine for some peace and quiet. Wilson Pond Camps is located on Maine’s largest lake and provides tons of fun for families of all ages. Rent a lakeside cottage and enjoy one of the many outdoor activities the resort has to offer. Since 1916 Migis Lodge has been catering to families on their 125-acre resort with over 3,500 feet of prime shoreline on Sebago Lake. 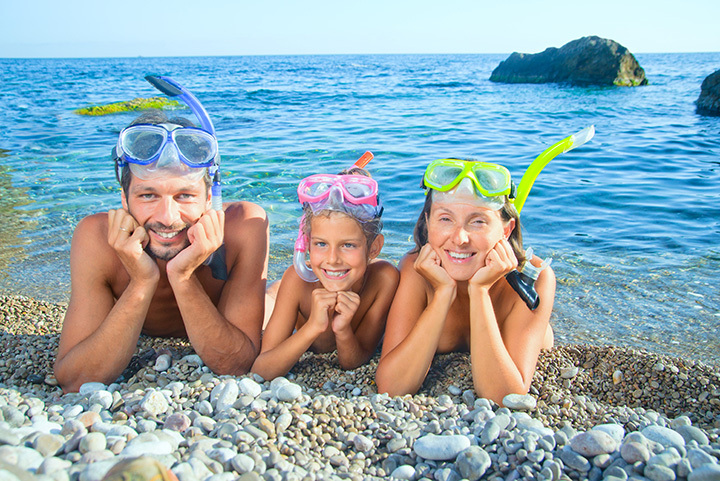 The resort has something for everyone from swimming to boating to “Kids’ Camp.” Migis Lodge also offers private babysitting if you’re looking for a night away from the kids.